Vancouver – A just-published paper in the prestigious journal Nature highlights how researchers at the BC Cancer Agency are using human breast cancer ‘avatars’ — models of human breast cancers — to measure how complex cancers develop and change over time. The research is unprecedented because it uses single cancer cells to expose how breast cancers evolve and how to identify the cell populations that expand and dominate over time. The study is the most comprehensive analysis of cancer evolution in lab models. 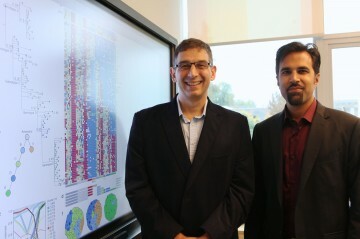 It uses a combination of genomic sequencing and a novel computational model— PyClone — developed by BC Cancer Agency scientist Dr. Sohrab Shah who is the co-senior author of the study and the Canada Research Chair in Computational Cancer Genomics. The team, including authors Dr. Peter Eirew, Adi Steif and Jaswinder Khattra, has set a gold standard in their ability to measure breast cancers’ evolution over time —resulting in a critical standard for future pre-clinical drug testing. The published findings provide the global cancer community with an invaluable method to track the cell populations and mutations that dominate and emerge as the driving force of a person’s cancer. “We now have the ability to determine which individual cancer cells are the ‘resilient’ ones, which, if left untreated, will have the most impact on patient survival,” said Dr. Shah, scientist, BC Cancer Agency, and assistant professor, University of British Columbia, Departments of Pathology and Laboratory Medicine and Computer Science. The research, vital to future drug studies, proves that treating cancers is akin to shooting at a moving target. Different cell groups within a complex cancer have varying abilities to survive and grow, and this causes the composition of the cancer to change over time and in response to drug therapies. Until now, the evolution of a patient’s cancer has been largely overlooked from a treatment perspective without a way to accurately analyze and measure the changing cell populations. With the power of genomic sequencing being integrated into patient trials at the BC Cancer Agency, this major advancement comes at a critical time, providing a model to determine a cancer’s growth trajectory. “Today, we are light-years ahead in the understanding of cancer, thanks to the work of Dr. Aparicio and Dr. Shah and their research colleagues, who have the support of BC Cancer Foundation donors in their ability to influence the next wave of targeted cancer care,” said Douglas Nelson, President & CEO, BC Cancer Foundation. • Research was conducted in lab models using patient-donated human breast cancer tissue samples, so-called “avatars” of human cancer. • The team’s novel approach combines technologies to sequence mutations in individual cancer cells with powerful statistical models (PyClone) to determine how different cell populations evolve over time. • The research was carried out by lab scientists and “bioinformaticians” at the BC Cancer Agency and University of British Columbia, in collaboration with the University of Cambridge. • Human cancers, including breast cancers, are comprised of multiple clones (cell populations) which have differing mutations and evolve dynamically in space and time. The study shows a level of predictability in the evolution patterns even in complex cancer cases. • Understanding how different cell populations evolve is key to understanding how cancers become resistant to drugs, and may lead to the development of new combination drug approaches targeting different cell populations at the same time. • The study shows that evolution is more extensive in cancer avatars than had been previously thought. This is vital information for scientists conducting lab-model based drug testing. • Genomic mutations identified at the time of diagnosis are important factors in determining how the cellular make-up of a cancer may change over time. The BC Cancer Agency, an agency of the Provincial Health Services Authority, is committed to reducing the incidence of cancer, reducing the mortality from cancer, and improving the quality of life of those living with cancer. It provides a comprehensive cancer control program for the people of British Columbia by working with community partners to deliver a range of oncology services, including prevention, early detection, diagnosis and treatment, research, education, supportive care, rehabilitation and palliative care. For more information, visit www.bccancer.bc.ca. The BC Cancer Foundation is the bridge that connects philanthropic support and research breakthroughs in cancer knowledge. As the fundraising partner of the BC Cancer Agency and the largest funder of cancer research in this province, we enable donors to make contributions to leading-edge research that has a direct impact on improvements to cancer care for patients in British Columbia. We fund with the goal of finding solutions. Visit www.bccancerfoundation.com to make a donation or to learn how you can make a difference in the lives of those affected by cancer.